As per Amazon: "A collection of short horror, ghost, and dark fantasy stories for adults, woven together by a flock of crows, telling stories to entertain a girl trying to survive a tragedy..." That line alone made me interested in reading this book. 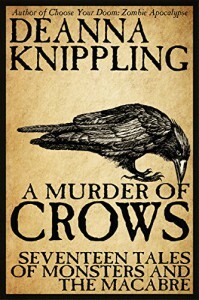 At first I wasn't sure how to review this book because I wasn't completely certain what was happening in the overarching storyline about the crows and the young girl. I know there is symbolism there I am missing, through no fault of the author. So I decided to take the book at face value, a collection of 17 short stories. I've read other short story collections where each tale seemed so similar to the last that they all blend together. You don't have to worry about that here. Each story is an individual that stands out from the crowd. The author is very skilled at giving each story its own voice. The endings are open-ended so the stories make you think too. I especially enjoyed "Vengeance Quilt" and "Family Gods." I would love to see those two stories worked into full-length novels.